Portadown manager Ronnie McFall. Pic by PressEye Ltd.
Portadown have rejected a formal transfer request by striker Darren Murray. Murray delivered the paperwork to Portadown on Tuesday afternoon via e-mail - describing in an exclusive with the Portadown Times his pursuit of a career in full-time football as the reason behind the decision. 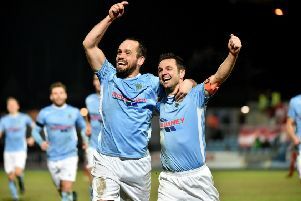 It is understood that both Cliftonville and Linfield have an interest in the Belfast-born striker but Ports boss Ronnie McFall is refusing to let anyone leave Shamrock Park. Portadown’s budget restrictions will prevent the club from adding to the squad this summer according to McFall and, as a result, he is determined to retain those under contract. “We received the e-mail request on Tuesday but Darren is under contract and not available to other clubs,” said the Ports boss. “We have not received any bids but Cliftonville did make us aware of interest in a deal. “We have not heard anything from Linfield or any other club. “We will submit a formal reply but our stance remains the same as last week, that players under contract will be staying. Summer speculation has surrounded the Portadown camp - with Murray, Gary Twigg, Peter McMahon and Chris Ramsey all linked to rival Irish League clubs. However, McFall has held firm in his stance regarding players under contract departing from Shamrock Park.